Don't go home for the holidays empty-handed! With only a week left before the feasting begins, I'm rounding up some of my favorite finds for the holiday host. From chic gifts for the home to simple gestures, these thoughtful displays of gratitude are sure to liven up the table setting and ensure you get invited back next year! If you're looking to gift your hostess something graphic and glamorous, look no further than the Canaan line of marble tableware and desk accessories from Jonathan Adler. The salt and pepper shakers are a personal favorite, and a timely choice for the feasting festivities! Nothing completes a holiday table setting like a fabulous floral arrangement! Presented in a stunning velvet jewel-tone box, these roses in white are the right way to say 'Thank You' to anyone opening their home for the holidays. I can't think of a sweeter way to say 'Thank You' than Sugarfina's colorful candy trunk! This is sure to be one piece of luggage your host won't mind having in the house for a few extra days! Give the gift of a good cause with a bottle of One Hope Wine! Not only is the glittery bottle the perfect addition to the festive table setting, but it's the perfect way to give back as part of the Thanksgiving holiday, with each purchase supporting causes like breast cancer research and autism awareness! Holiday gatherings are all about making memories with those you love. What better way to 'wow' the host than with an after-dinner family favorite? 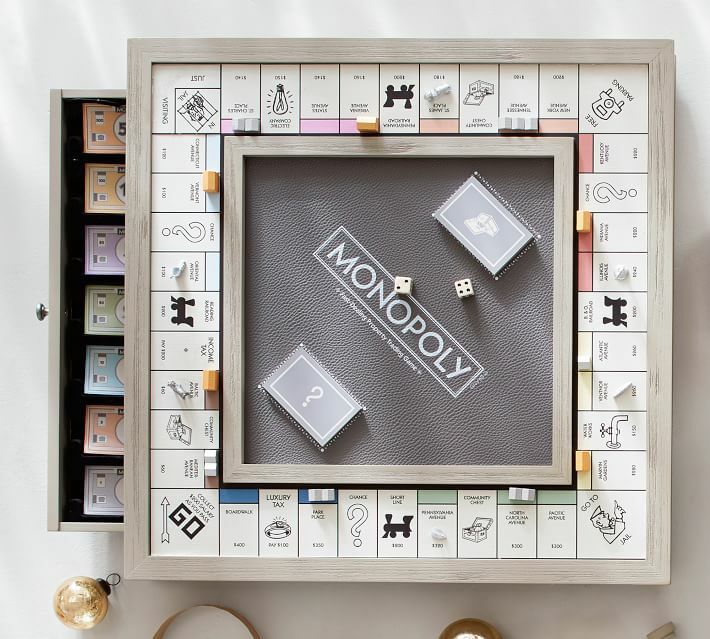 Start a new tradition, and leave this elegantly crafted edition of the classic Monopoly game behind for your host to enjoy for generations to come!